Currency markets broke stride awkwardly. The yen responded immediately to the BOJ and ended Friday’s session up 3.05% at session highs. The Japanese currency has rather briskly recovered much of its recent pullback. The markets – and apparently the financial media – beckon not for limp and cautious, but rather for unyielding and radical. If monetary stimulus is not working as prescribed, that obviously means it must be executed more frenetically. If the most aggressive monetary stimulus ever is increasingly ineffective, the only solution is to go completely radical, nuclear and helicopter. Of course it’s reckless and doesn’t make good sense. So markets are especially sensitive to any indication that central bankers might be losing their nerve or contemplating a reassessment. Coming two days after Prime Minister Shinzo Abe revealed a gigantic $265 billion stimulus package, in what has become serial “special” stimulus, the Bank of Japan’s announcement took on greater significance. The BOJ might move aggressively in September, but Friday’s disappointment is a timely reminder that there is underlying unease in Japanese policymaking circles. Prolonged massive stimulus has helped push Japan’s jobless rate down to a modern day record low 3.1%. At the same time, the primary objective of forcing consumer price inflation up to 2% remains elusive. With aggregate consumer prices down 0.4% over the past year, the Bank of Japan Friday slashed their CPI forecast for the current fiscal year to 0.1% from 0.4%. Global downward pricing pressures – including sinking crude prices – suggest little relief is in the offing. At this point, BOJ monetization is like pounding one’s head against a wall. Japan has been fighting deflationary headwinds since the bursting of their Bubble more than 25 years ago. It was a major Bubble exacerbated by a loosening of monetary conditions in the U.S. back in the late-eighties coupled with intense pressure from the U.S. to stimulate Japan’s economy to help rectify ballooning U.S. trade deficits. And it’s somewhat ironic that in 2016 Japan’s biggest adversary in its post-Bubble deflation fight is engaged in its own Bubble Battle across the East China Sea. One could argue that Japan lost all control of its Bubble with the onset of post-1987 crash aggressive monetary accommodation. Chinese control was lost with the massive post-2008 stimulus, and it’s been awhile since I’ve read reference to Chinese officials having learned from the Japanese experience. Indeed, seeds for today’s runaway global finance Bubble were planted in Japan and came to full bloom with China’s historic Credit expansion. And for 25 years, global central bankers have chanted “deflation” as enemy number one. But it’s been Bubbles all along. They remain the dominant risk today, as they’ve been all the way back to the late-eighties. The global government finance Bubble can at this point be simplified into six powerful intertwined forces: 1) Near zero rates and record low bond yields virtually across the globe contributing to generally loose fiscal spending and ever rising country indebtedness; 2) Near $1.0 TN annual market liquidity injections from the ECB; 3) Near $1.0 TN annual market liquidity injections from the BOJ; 4) Annual Chinese Credit growth of about $3.0 TN, powered by state-directed bank lending; 5) Ongoing ultra-dovish Federal Reserve policy – with attendant loose financial conditions and booming perceived wealth in U.S. asset markets (exacerbated by strong foreign sourced flows); 6) The deeply engrained perception throughout global markets that central bankers in concert are committed to doing “whatever it takes” to ensure that markets remain liquid and levitated, a backdrop the promotes risk-taking and leveraged speculation (in the face of mounting risks). Going back to the earliest CBBs, it’s been a central argument that the transformation to securitized Credit was both a momentous and precarious development. History is unequivocal: Credit is inherently unstable. The thesis that contemporary market-based Credit is highly unstable should not at this point be contentious. And the greater the expansion of contemporary market-based finance, with cumulative latent vulnerabilities, the more overpowering the impetus for governments and central bankers to monkey with and backstop unsound markets. And now decades of backstops, bailouts and reflations have nurtured dysfunctional markets that have regressed to total dependency to ongoing government market manipulation, monetization and reckless monetary inflation. And this helps explain diametrically opposed global markets views: The bullish perspective sees an unusually stable backdrop (VIX closed the week below 12! ), with notably resilient markets having repeatedly persevered through brief bouts of market tumult and various geopolitical developments. Monetary management is “enlightened.” The bearish view sees an acutely vulnerable global financial “system” at this point patched together with “whatever it takes” liquidity injections and market manipulation the likes of which the world has never previously experienced. Policymakers are perpetrating history’s most destructive monetary inflation. The hope has always been that aggressive global fiscal and monetary stimulus would raise inflationary expectations and spur more generalized Credit and economic booms. It had worked previously, although nothing from the past was comparable to the scope of the mortgage finance Bubble and the subsequent post-Bubble global reflationary free-for-all. The combined inflation of national debt and central bank Credit was so enormous that there would be no turning back from resulting epic Bubbles. Bubbles always require rapid and increasing Credit expansion. The global government finance Bubble is no different. The world is generally at near zero rates, negative sovereign yields, large deficit spending and about $2.0 TN of annual global QE. Effects have dissipated, ensuring what was originally “shock and awe” overwhelming force is near the brink of not being enough. Crude has sunk back to near $40. Growth has slowed again in Europe, the U.S. and throughout Asia. With the French economy flat-lining, Eurozone Q2 GDP (0.3%) was half of Q1’s. Considering that some sectors and locations are in powerful Bubbles, 1.5% (annualized) Q2 GDP growth speaks poorly for the overall U.S. economy. Ten-year Treasury yields dropped 10 bps this week to 1.45%, clearly betting against Federal Reserve tightening. Global markets beckon for more loosening. Markets demand that the Bank of Japan turns crazy reckless, even as evidence mounts that now routine reckless hasn’t worked. The markets need Chinese policymakers to ensure $3.0 TN of annual Credit growth, even though it’s apparent to communist leadership that such a course is fraught with major risks. The markets stipulate that the Draghi ECB must continue printing at a Trillion annualized pace, in the face of unprecedented market distortions, internal policy discord and great financial, economic, social and geopolitical risks. “Terminal Phase” excess sees rapid expansion of increasingly risky Credit. A hypothetical graph of systemic risk grows exponentially skyward. Accordingly, the risk intermediation task turns burdensome and fraught with great risk. Somehow the financial sector must transform (Trillions of) increasingly risky loans into financial instruments with more appealing (money-like) attributes. Chinese “shadow banking” is an intermediation accident in the making, and it’s rational that spooked regulators would now target WMPs. It’s not clear how China at this stage can move to rein in egregious excess without inciting a tightening of financial conditions and resulting Credit and economic slowdown. It was an interesting week in the markets. Global sovereign yields retreated back to within striking distance of recent historic lows. Gold jumped 2.2% and silver surged 3.6%. Yet copper posted a slight decline, while WTI crude sank 6.3%. Examining this week’s developments in Japan and China, as a trader I’d have greater concern for the global financial and economic outlook. It’s fascinating – as opposed to confusing - to watch gold and crude diverge. The yen bears – and dollar bulls – had the rug again pulled out this week. I see ongoing currency market volatility as a harbinger of general market instability. Sinking crude had high-yield energy debt under pressure, along with Mexican stocks and the peso. The Russian ruble declined 1.8% and the Colombian peso sank 4.1%. Equities were determined to retain their strong July gains, while the VIX holds confidently to the view that “whatever it takes” remains in firm control. Could be an interesting August. No matter who wins the White House in November, don’t expect to hear new calls for reduced spending. Gone are the fights of yesteryear over striking a “grand bargain” to slash the debt. In their place a new debate has emerged over whether America’s borrowing capacity has gone up—and how the nation might take advantage of it. The top candidates from both major parties have made scant mention of addressing rising long-term deficits and are calling instead for an increase in federal stimulus. Republican nominee Donald Trump has outlined massive tax cuts and, without getting specific, has promised big federal outlays on infrastructure, border security and an expansion of health-care services for veterans. The GOP platform calls for a constitutional amendment requiring balanced budgets, but that’s easier said than done, as illustrated by congressional Republicans’ inability to pass a budget resolution this year. Hillary Clinton, the likely Democratic nominee, also has issued proposals for spending on roads and higher education, projects she would fund with new taxes on higher-income earners and the financial industry. Four years ago, the Democratic Party platform referred seven times to cutting the deficit. The platform that delegates will consider at this week’s convention in Philadelphia doesn’t mention the deficit and pledges to pay for new spending. The shift on both sides of the aisle is remarkable because it coincides with what economists consider full employment. The 2012 election turned largely on how Washington would end a series of rolling budget crises. Huge deficits after the 2007-09 recession sparked fears of runaway inflation that would bring higher borrowing costs, choking growth. President Barack Obama’s re-election didn’t fully resolve the fight by producing one big budget accord. Instead, it led to a series of smaller deals that raised taxes on the wealthy and gradually loosened automatic, across-the-board curbs known as the “sequester.” There was drama along the way. In October 2013, the government shut down for 16 days. Now, years of curbs on military and domestic programs have pushed the pendulum in the direction of more, not less, spending. Congress and the White House agreed last fall not only to a budget deal that boosted spending but also to extending a series of tax breaks without providing for offsetting revenue increases or spending cuts. So what accounts for the shifting political dynamic? First, an expanding economy and the budget agreements of recent years have returned near-term deficits to their long-run averages. Second, health-care cost growth, a major driver of projected deficits, has slowed. Third, markets indicate borrowing costs may be lower for longer than anyone expected just a few years ago amid weaker global growth prospects. The national debt as a share of gross domestic product has more than doubled since 2007, to around 75%, but net interest payments on the debt have actually declined. They fell to 1.25% of GDP last year, the lowest level since 1968. 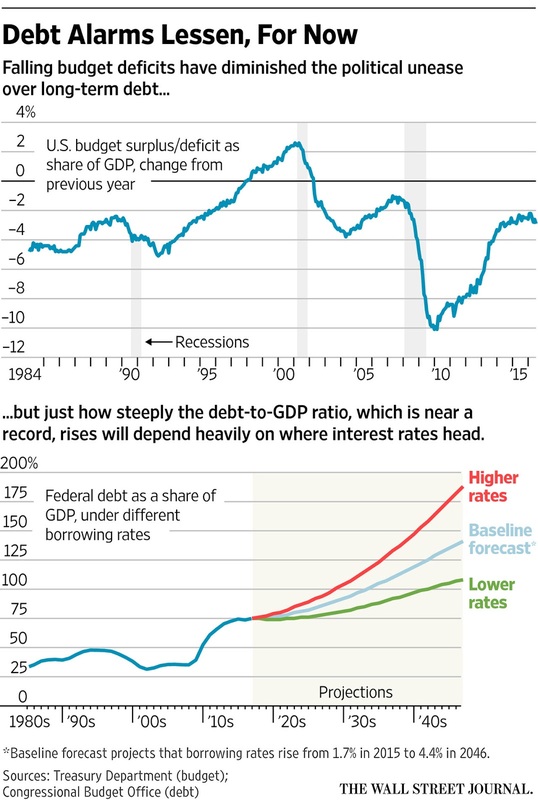 Long-term deficits haven’t gone away, of course. 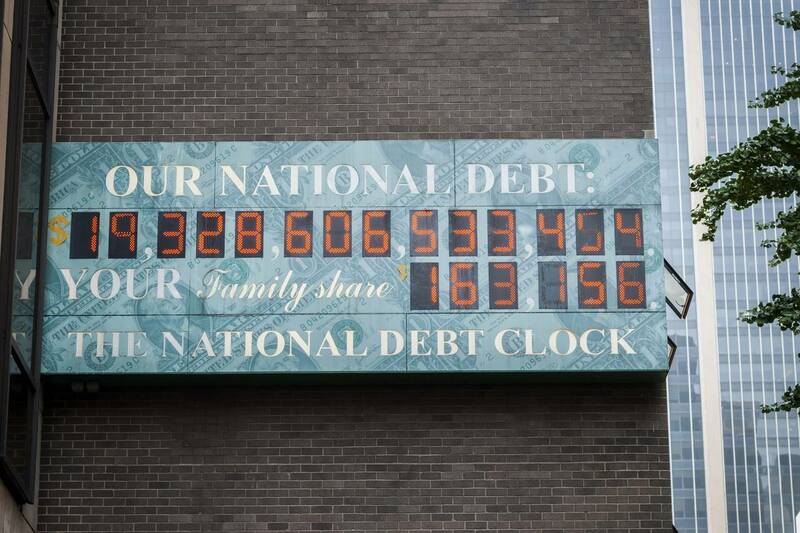 The Congressional Budget Office this month said the national debt was on track to exceed the total output of the economy by 2033, six years earlier than last year’s forecast. The change was largely due to last year’s policy changes. Also, a rising share of federal spending will be on autopilot as more retirees become eligible for Medicare and Social Security, whose spending isn’t appropriated annually by Congress. The current low-rate environment “offers a false sense of security,” said Michael Peterson, president of the Peter G. Peterson Foundation, a group that pushed for deficit reduction. Still, the shifting political consensus echoes a similar rethink among some economists who say that stronger demand from abroad for U.S. Treasurys could keep interest rates lower for longer. That would boost the case for tolerating higher debt levels, said economists Doug Elmendorf, who headed the CBO from 2009 until 2015, and Louise Sheiner of the Brookings Institution, in a paper in February. They argued any boost in spending should go toward policies that raise slumping labor productivity to lift economic growth. When interest rates fall below economic growth rates, governments can borrow while still holding down the debt-to-GDP ratio. Low rates may present the U.S. with such an opportunity. “Extraordinarily low interest rates makes the economics of public investment profoundly different than it appeared a decade ago,” said Larry Summers, an economist at Harvard University and former U.S. Treasury secretary. Mr. Summers has warned of “secular stagnation,” a chronic deficiency of investment that leaves the world stuck in a low-growth rut. But even if he’s wrong, aging workforces in Europe and Japan and other global developments that boost foreign demand for Treasurys mean the U.S. could remain “in a low-interest-rate, high-saving, challenge-of-absorbing-savings world for at least years to come,” he said. None of this means the U.S. will escape long-run, demographic-driven spending challenges. But it could buy the next president a little more breathing room. First things first. Donald Trump could beat Hillary Clinton. To many Americans, mere talk of it is preposterous. They should get used to it. At some point, Mr Trump is likely to take a lead in the polls. Mrs Clinton, moreover, is capable of squandering her inbuilt advantage. Whatever happens at the Democratic convention in Philadelphia this week, the next three months will be the battle of her life. What should most concern the anti-Trump forces? Mrs Clinton’s biggest hurdle is the depth of hatred for her across large parts of America. Personally, I have always found Hillaryphobia hard to fathom. As first lady in the 1990s, she was hated for being a creature of the left — her supposed radical feminism and her push to enact leftwing healthcare reform. Nowadays she is reviled for the opposite reasons. The Hillary Clinton of 2016 personifies Wall Street values and an entitled global elite. The common thread between these two phases, briefly suspended when she was Barack Obama’s secretary of state, is the view that every move she makes is for political gain. Nothing is authentic. Even Mrs Clinton’s gender is a kind of calculated ruse. Most foreigners — and many Americans — might shrug their shoulders. Elections are about choices. If this is a race between a career politician and a demagogue, it should be no contest at all. The problem is that big swaths of the US electorate, possibly a majority, view Mrs Clinton and Mr Trump as equally flawed. “They’re both corrupt so we might as well gamble on the outsider,” is a sentiment often heard outside the Washington beltway. If Mrs Clinton loses in November, it will be because she failed to overcome this lethal equivalence. It only takes you so far to point out — as Mr Obama has done and will doubtless reiterate in Philadelphia — that Mrs Clinton is the most qualified person in years to run for the White House. Mr Obama is right. But to many voters, the very word “qualified” is disqualifying. Nor is it sufficient to scare people about the risks of a Trump administration. To be sure, it would be negligent not to spell out what could happen. It is still hard to digest that America’s Grand Old Party cheered its heart out last week for a 70-year-old property developer who thinks he alone can fix America’s problems. Yet more than a year’s worth of hard-earned derision has done Mr Trump no harm at all. He has only grown stronger. Mr Trump does indeed betray traits of a political megalomaniac. He is intolerant of dissent, treats facts as beneath him, and presents the will to power as his case for the White House. His foreign leader of choice is Vladimir Putin, Russia’s president. As Mrs Clinton observed, Mr Trump is the man on the white horse. Yet a strongman is what many Americans say they want. A prince should be feared, says Machiavelli. Trying to frighten voters may even serve Mr Trump’s purposes. How, then, should Mrs Clinton respond? The first rule is do no harm. Her choice of Tim Kaine as running mate prompted yawns from many quarters. Journalists yearn for Sarah Palin-type excitement. Mr Kaine was a safe choice. He has blue-collar roots, knows how to win in a Republican state — as Virginia was when he first ran — and has the experience to take over should Mrs Clinton trip under a bus. He is one of just 20 people in US history to have been mayor, a governor and a senator. Sometimes boring is good. Nice is too. “Trying to count the ways I hate Tim Kaine,” tweeted Jeff Flake, the Republican senator from Arizona. “Drawing a blank. Congrats to a good man and a good friend.” In today’s polarised climate that carries weight. Besides, Mr Kaine’s bilingual announcement speech was anything but dull. The second rule is to make an energetic case for governing. Mr Trump’s biggest cheer in Cleveland was when he said: “I am not politically correct.” It is hard to escape the suspicion that Mrs Clinton is banking on non-whites to win in November. Relying on ethnic coalitions is also known as the Chicago model. It is a lazy form of politics always vulnerable to tokenism. Perhaps the Philadelphia convention will breathe life into a hitherto listless campaign. We can bet Mr Trump will tweet what it takes to steal Mrs Clinton’s publicity. Grabbing headlines is his core skill. What is Mrs Clinton’s? If it is politics as usual, we should prepare for a very tense election. Playing safe will be her natural instinct. But in these times that is the highest risk approach. If there is one thing that unites most Americans it is a visceral disdain for the status quo. Mr. Trump is not alone in making use of the facile notion that history is repeating itself. Pundits reach for the same comparison, and reporters do too, hoping to sound historically expert. Commentators are looking for bearings in what appears to be a universe atilt. There are precedents for everything, but the disconcerting truth is that America’s political situation is downright weird today — too weird to be flattened into historical parallels, though as always there are precedents to study and weigh. The feeling that “the world is falling apart” is easy to come by. It was surely how I felt in 1968 as a 25-year-old working for an underground newspaper in San Francisco, as unthinkable event followed unthinkable event. But as Tolstoy did not say, all chaotic times are chaotic in their own way. On the heels of the huge 1967 riots, and the police and National Guard killings that followed them, the upheavals of 1968 included the Tet offensive, the abdication of a president and the assassination of Robert F. Kennedy, police shootouts with Black Panthers, the assassination of the Rev. Dr. Martin Luther King Jr., and the deadly riots afterward, as well as rising street crime. They were, in sum, many orders of magnitude more grave and violent than what we experience now. American casualties in Vietnam reached their peak in 1968 — 16,889 dead — in a war fought by draftees amid huge and growing antiwar protests. The protagonists on the streets are different, too. We speak too glibly of protest and chaos, as if they come in a single flavor — bitter. Anxiety and alienation in a world that seems to have left many people behind is nothing new; it is, in fact, a hallmark of modernity. But in contrast to today’s Trump supporters, the civil rights and student movements of the ’60s were fueled by hope and anguish, not resentment. They did not want to Make America Great Again, they wanted to make it great at last. On the available evidence, Trump supporters are driven by feelings of dispossession and anger at immigrants and other out-groups they blame for their hurts. But the ’60s movement saw Washington as compromised and frozen; Trump backers see it as simultaneously stupid, corrupt, overeducated and out of touch with real Americans. Mr. Trump’s legions are successors to the backlash that fueled Barry Goldwater’s 1964 campaign and George Wallace’s in 1968. Wallace loved to aim venom at what he called “pointy-headed bureaucrats.” But in 1968, some of Wallace’s supporters were won over by the kinder, gentler version of law-and-order politics championed by Nixon. It has been a leading Republican theme for more than five decades that only muscle and armor can repel all the barbarians — those at the gates and also within them. Ronald Reagan’s political genius was to enfold the combat scenario within “Morning in America” uplift. It’s no wonder that Mr. Trump is recycling the imagery of apocalypse and panic, to the point of fabrication — for example, his claim that “crime is out of control, and rapidly getting worse,” when in fact between 2010 and 2014 (the most recent years for which F.B.I. figures exist), violent crime actually declined by about 7 percent. By comparison, between 1964 and 1968, violent crime rose by more than 50 percent. But Mr. Trump’s hope is to roll supposed Mexican rapists, murderers of policemen, terrorists, thuggish Chinese exporters, the Benghazi attackers and the nonviolent demonstrators of Black Lives Matter into an all-purpose satanic gang that can be addressed only by walls, deportations, jail and torture. To Mr. Trump and convention speakers like former Mayor Rudolph W. Giuliani, it’s not morning in America, it’s a minute to midnight. Even Mr. Trump’s nemesis, Senator Ted Cruz of Texas, echoed the apocalyptic spirit, telling conventiongoers, “What if this right now is our last time? Our last moment to do something for our families and our country?” In the manner of earlier authoritarians who sought to capitalize on widespread anxiety and resentment in order to justify the heavy hand, these Republicans proclaim that they are first responders ready to rescue us from disorder. The more intensely they can amplify the feeling of crisis, the more plausible they sound when they blame liberal slackness and ineptitude for disorder and promote the notion that Eden can be regained if only the leader is followed. 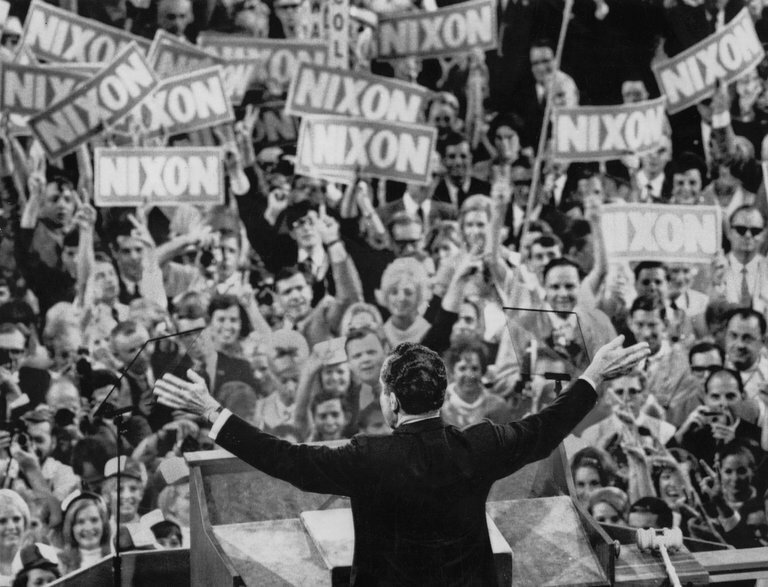 In 1968, Nixon was the master of the blended approach, adroitly combining a feint at ending the unpopular Vietnam War with a law-and-order appeal to co-opt panicky whites. Thus did he peel off many of the latter who might otherwise have favored Wallace’s independent campaign. Wallace, the former Democratic, segregationist governor of Alabama did win five Southern states and 13.53 percent of the vote, but he had been neutered. In some ways, Mr. Trump channels Wallace, the most popular of the 1968 candidates among young white men, with an especially strong showing among Midwestern blue-collar workers in the regions we now call the Rust Belt. Law and order was, you might say, his trump card. For paranoid politics in need of a defining passion, barbarians are (in the words of the poet Constantine P. Cavafy) “a kind of solution.” Harking back to the monsters of yesteryear is a tested stratagem. But the most serviceable apocalyptic scenario requires a belief that the barbarians have already set up camp within the gates. This has been a Trump theme throughout his campaign. So it was that, after the Orlando massacre, Mr. Trump insinuated, not for the first time, that President Obama was a sort of Manchurian, or Kenyan, or in any event Muslim president. Along the same lines, in Cleveland on Monday night, Iowa’s far-right Senator Joni Ernst, distorting F.B.I. statements, warned the convention that “terrorists from ISIS are in every one of our 50 states.” This sounded a bit like the warnings of Senator Joseph R. McCarthy and those, too, of presidents Lyndon B. Johnson and Nixon, who thought foreign Communists were the puppeteers and paymasters lurking behind antiwar marionettes and summoning them to the streets. The C.I.A. and the F.B.I. tried — and failed — to unearth those malignant forces, but never mind. This is where Citizens of the Age of Trump may take heart. Even as America in the ’60s was subject to vastly more political violence than today, Ernstian panic did not prevail even after Nixon took control of the security apparatus. Even as tens of thousands of Americans were dying in a futile war opposed by millions, and the leadership of the Republican Party sought to drumbeat the populace into a hatred of radicals, hippies and “impudent snobs,” the country at large did not succumb to unbridled hysteria. The eerie truth is that 2016 is so deeply unnerving not because it is “like 1968” but because it isn’t like anything else. It’s sui generis. There is probably no panic-stricken majority, silent or otherwise — at least none that can agree on the right reasons for panic. In 1968, it was the Democratic Party that failed to overcome its cleavages; today, if anything is falling apart, it’s the Republican Party and its hope of piecing together a new “silent majority.” In fact, today’s operative majority may be the one panicked by the thought of Donald Trump in the White House. U.S. companies feel a chill from both parties and from voters. Time to emphasize the long-term common good. We may not know who will win the 2016 presidential election, but we already know who has lost it: corporate America. Open warfare has broken out between the U.S. Chamber of Commerce and the Republican nominee. The less-combative Business Roundtable makes no secret of its dismay over the choice of candidates it faces. The turn away from free trade and welcoming immigrants confuses business leaders who still cannot understand why anyone would object to these policies. The corporate sector favors moderation in social policy and a steady internationalism in foreign policy—the reverse of the main currents within today’s Republican Party. Nor is big business as comfortable with Hillary Clinton’s Democratic Party as it was with her husband’s, and with good reason. The party’s new left-leaning populism sees large firms as a principal source of the ills of working- and middle-class Americans. A Democratic victory in November would guarantee moves to rein in the financial sector, heighten scrutiny of mergers and acquisitions, and put the squeeze on corporations that shift jobs and profits overseas. The political homelessness of corporate America is a kind of rough justice—the consequence of policies that have ended by alienating huge numbers of Americans. As recently as 1999, according to the Pew Research Center, 73% held “very” or “mostly” favorable opinions of corporations. By spring 2008—months before the financial crash and onset of the Great Recession—that share had already declined to 47%, and it fell further, to 38% in 2011, before bottoming out. Other surveys help explain this negative attitude. In 2014, 66% of Americans told Gallup that big businesses were successful at creating jobs in foreign countries with which they were doing business. But only 43% thought U.S. companies were creating jobs domestically; 54% said firms were doing a poor job of balancing the best interests of the U.S. and American workers with the best interests of their company. Businesses have one view of “global supply chains,” it seems, and average Americans quite another. The moral for corporate leaders is clear: If you care only about shareholder value, only your shareholders will care about you. And when a political crunch comes, your shareholders won’t be numerous or powerful enough to save you. In a modern democracy, a stable relationship between citizens and corporations rests on a tacit compact. The people are willing to give big business substantial latitude to chart its own course. In return, business leaders are expected to give due weight to the interests of the people, including not only the businesses’ employees but also the citizens of the communities whose well-being the leaders’ decisions affect. In the three decades after World War II, all parties to this compact understood its terms and mostly honored them. 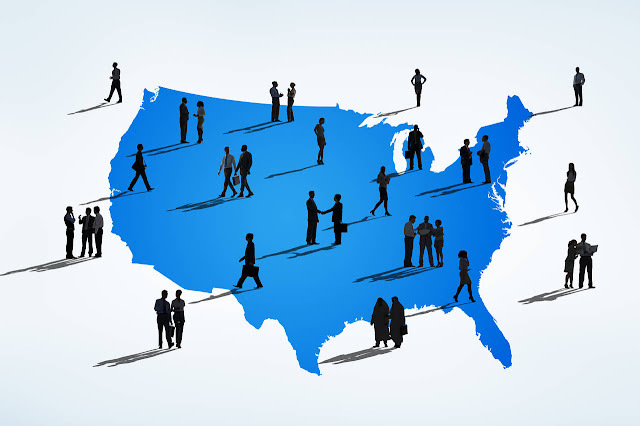 Since then, the social compact has weakened steadily, and many Americans now believe that it has broken down altogether. They have come to view corporations as employing a narrowly self-interested calculus to determine the level of wages and the location of production. And they are fighting back with the only weapon they have—their vote. Many corporate leaders insist that they are doing what they must amid intensifying global competition. Their real choice, they say, isn’t between paying U.S. workers $20 an hour or Mexicans $3 an hour to make air conditioners, but rather between paying Mexicans $3 an hour and going out of business. No doubt this is true in some cases. But if global competition is so intense, why are profits at near-record levels as a share of the GDP? Why is executive compensation soaring? It is hard not to conclude that many firms have taken advantage of soft labor markets to keep workers’ wages and benefits low. If workers benefit from their firms’ performance only when full employment episodically enhances their bargaining power, they won’t enjoy the steadily rising standard of living that lies at the heart of the American dream. Looking back, they see that their household incomes are no higher than they were in the late 1990s. Looking ahead, they don’t expect better lives for their children. Under these circumstances, it is easy to understand why so many Americans are in open revolt against policies they view as undermining their future. And they have grasped a key point: Globalization isn’t an abstract, irresistible force. It has political preconditions, including legal protections for mobile capital. Without international agreements, businesses could not confidently invest in new markets abroad. It is telling that neither party’s presidential candidate has endorsed the Trans-Pacific Partnership—and that the business community is surprised. Business leaders should examine their own role in bringing this about. Unless they are willing to live with an America of increasing economic insularity, they must look beyond narrow, short-term self-interest to the long-term common good on which their own well-being ultimately depends. One of the most intractable problems in economic history is translating the value of money over time. What would $1 million in, say, 1816, be worth in today’s money? The consumer-price index, based on the price of a basket of commodities, works as a measure of inflation over small periods of time. But while the CPI has actually been calculated back to the beginning of the 19th century, such a period has seen the creation of a completely new and vastly richer economy. The basket of commodities that people actually buy has changed radically. Servants were cheap in 1816; lunch could be bought for a nickel; the rent on a luxurious town house in Manhattan would have been under $100 a month. But clothes, which had to be handmade, were very expensive, as was private transportation (hence the phrase “carriage trade”). The best we can do is to ballpark it: In 1816, $1 million would have made its owner one of the richest people in the country, easily in the top 10 of the Forbes 400 list, had there been one then. Indeed, a net worth of $1 million (or one million pounds sterling) was so rare in 1816 that the word millionaire had only just entered the English language. So if grasping the economic meaning of $1 million a mere two centuries ago is difficult, how can we understand the wealth of a man who lived in the 14th century? One way is to see how his spending affected an entire national economy. Musa Keita I (circa 1280 to circa 1337) was the ruler of the Mali Empire in west Africa. 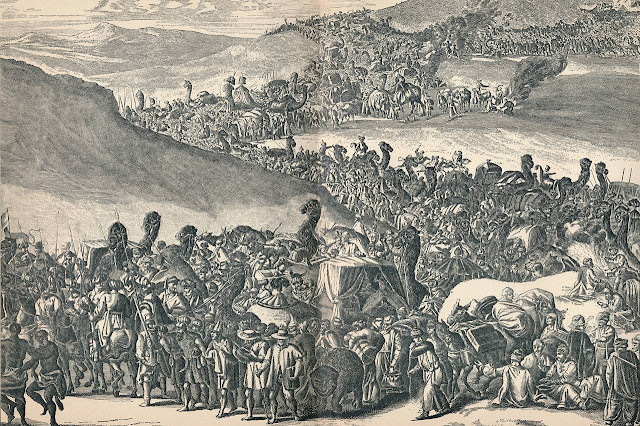 Taxing the many camel caravans that crisscrossed the Sahara Desert every year produced considerable imperial income. But two local commodities had made his country very, very rich: gold and salt. In the 14th century, Mali produced about half of the Old World’s gold from three highly productive mining regions. Bags of gold dust functioned as money in the kingdom, while nuggets were stored in the treasury as the property of the emperor. Salt, an essential commodity for many purposes in the Middle Ages, came from a great salt pan near Taghaza, in the north of the present day country of Mali. Salt was so abundant and cheap there that slabs of it were used to construct buildings. But when loaded, two slabs to a camel, and shipped south to coastal regions where the commodity was scarce and expensive, salt became very valuable indeed. MANSA MUSA, AS HE IS USUALLY remembered in Western sources (Mansa means “emperor”), was a devoted Muslim, and one of the obligations of the faithful, if they can afford it, is to make the hajj, or pilgrimage to Mecca, at least once in their lives. Mansa Musa could afford it, and in 1324 he went. The journey from the Mali empire’s capital at Timbuktu to Cairo is 2,347 miles, and it is a farther 800 miles to Mecca. A camel caravan can travel only about 15 to 30 miles a day, and the huge size of Mansa Musa’s caravan may well have made its pace even slower. The round-trip journey would take two years to complete, although there were several extended stops along the way. Ancient and medieval chroniclers habitually exaggerated numbers, but, according to these sources, Mansa Musa had a personal bodyguard of 500 soldiers, along with more to guard the entire caravan. There were also servants, cooks, camel drivers, porters, and livestock herders. Altogether, the number of people accompanying Mansa Musa was certainly in the thousands, though it is not likely to have been as high as 60,000, as some of the chronicles claim. These chronicles also claim that there were 12,000 slaves on the pilgrimage, each carrying, among other things, a four-pound gold bar. And 80 camels, it was said, each carried 300 pounds of gold. That would make a total of 36 tons. At the current price of gold, that would be more than $1.5 billion worth of the precious metal, an inconceivable sum in medieval terms. As he made his way to Cairo, Mansa Musa distributed alms to the poor and gave presents to local rulers to assure their friendship. In Cairo, he made the sultan a gift of 50,000 gold dinars, more than 7,500 ounces of gold. Not surprisingly, the sultan was happy to lend Mansa Musa his summer palace for a three-month stay. WHILE IN CAIRO, THE EMPEROR and his vast entourage spent gold so lavishly on slave girls, clothes, food, and artwork that he flooded the Egyptian economy with the stuff, causing its price to fall by as much as 25%—an inflation in the same degree in prices in the Egyptian economy, one of the Muslim world’s largest and most prosperous. Although Mansa Musa took out a substantial loan in gold on his way back from Mecca, perhaps to reduce the quantity in circulation and stem the inflation he had caused, the contemporary chronicles say that it was 20 years before the Egyptian economy fully recovered. Mansa Musa did not spend his money solely on wine, women, and song. He also founded mosques and schools along the route of his journey. And he brought back scholars to help found a university in Timbuktu that was soon one of the leading academic centers in the Islamic world. He also brought back architects and artisans to build libraries, palaces, and mosques, many of which still survive. At its height, the university had about 25,000 students, and the library held perhaps a million manuscripts, the largest in Africa since the destruction of the great library of Alexandria in ancient times. Many of these manuscripts still survive, despite recent incursions by Islamic terrorist organizations. JOHN STEELE GORDON is the author, most recently, of Washington’s Monument: And the Fascinating History of the Obelisk.